Updates on the launch of the Horley in Spring Competition, Carnival, Town Meeting, Yoga Classes, Conservation Group and work on clearing the blockages in the Burstow Stream. We are pleased to announce that the Horley in Spring Competition for 2016 has just been launched. We hope that many local residents, businesses and community groups will be keen to enter. Once again, as well as inviting entries from the parish of Horley, we will also be inviting entries from Hookwood. Schools from Charlwood, as well as from Horley, will also be invited to enter. Entry forms are available from the Town Council Offices and can also be downloaded here. Judging will take place between late March and early/mid April, dependent on weather conditions. The closing date for entries will also be dependent on weather conditions so please check here or contact the Town Council Offices for more information nearer the time. All results will appear in the local press and on the Town Council website. Edmonds Community Hall for Hire ....Around the Clubs! Yoga has been a fixture every Monday morning at the Edmonds Community Hall for several years. Whether you are new to yoga or have an established practice, all are welcome to come along and try the classes. Each class consists of posture work, breathing practices and deep relaxation. Practitioners report that regular practice tones and stretches the body and helps them to improve strength, flexibility and an improved sense of mental and physical wellbeing. Come along and give it a go! Classes are suitable for all regardless of your age or level of fitness as all postures can be modified and adapted to suit each individual. Class times: 10:00 to 11:30 and 11:45 to 12:45. By popular demand, the Horley Carnival will return! It will be held on Saturday, 18 June 2016 in the Horley Recreation Ground. Whilst most people were still recovering from Christmas and New Year celebrations members of the Horley Conservation Group were busy at work. 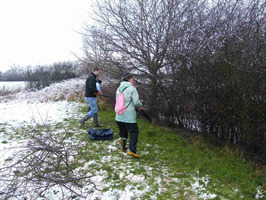 With snow laying on the ground a team of volunteers made their way to Emlyn Meadows to work off some of the extra calories taken in over the festive season. The team cut back blackthorn that was encroaching on both sides of the style and on the pond. The pond area itself was cleared of rubbish and had a substantial amount of vegetation raked out. You can see the team at work in the attached picture. The next task is on February 20th at Langshott Woods when some of the Rhododendron growth will be cut back and burnt. Our proposed task diary for the first half of 2016 is shown on the website so please feel free to turn up on the day – suitably dressed down! The role of Mayor includes the responsibility for civic, ceremonial duties as well as promoting the Town and the Town Council. The Town Mayor is elected annually by his/her fellow 17 councillors and serves for a period of 12 months during the civic year that runs from May. 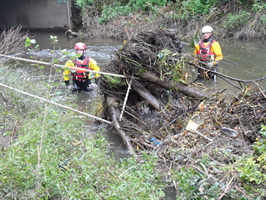 The Burstow Stream has had two serious blockages cleared by Specialist Group International Ltd (SGI). The blockages, caused by large trees across the watercourses, were deemed by the Environment Agency to be a serious flooding threat to nearby housing. 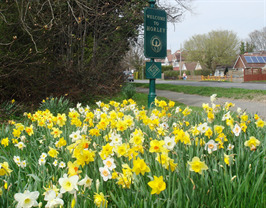 Peter Faulding, Chief Executive of SGI, will be our guest speaker at the Horley Town Meeting to be held on Friday 29 April 2016 when he will be describing some of their important work in the community. Please check out our online "what's on" calendar for information on forthcoming events. Did you know you can submit your own organisation's event? Just follow the instructions on our website.